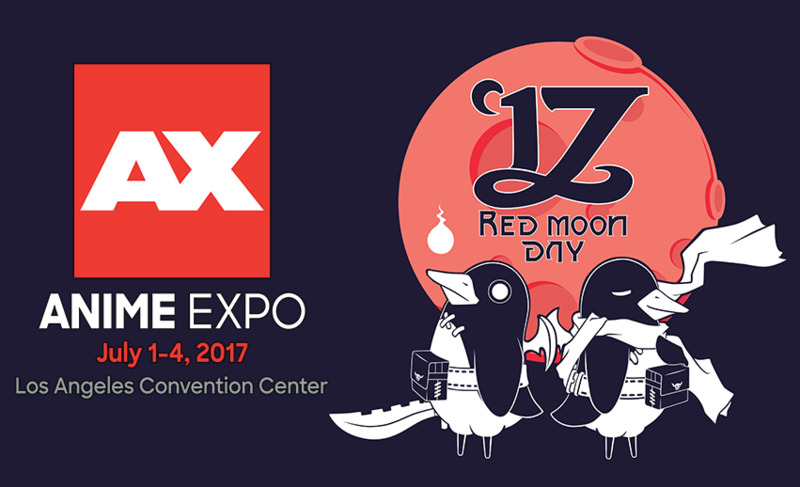 We're Headed to Anime Expo 2017! | NIS America, Inc.
Home / Blog / We're Headed to Anime Expo 2017! Crazy fun activities, prizes, giveaways and more await! Hey, dood! Jupy here with some awesome updates! Anime Expo 2017 is only a few days away, and NIS America’s Prinnies are going to be there yet again! We’ve whipped up some SUPER awesome things this year and it’ll be our BIGGEST Anime Expo yet! Be sure to visit us at booth 2411 for all the Prinnytastic fun! Check out our programming details below and join us for a summer blast! Toshihiro Kondo is the president of Nihon Falcom, the developer of games such as Ys and the Legend of Heroes (Trails of) games. Sohei Niikawa is the president of Nippon Ichi Software and the father of Disgaea. Description: Translating and editing seems like a straightforward gig, right? How about translating and editing almost 2.5 million Japanese characters? NIS America introduces the localization team for Danganronpa V3: Killing Harmony, where they will discuss their work, challenges, stories, and overall expertise on localizing a massive project. Description: How do you go from running a fan website to becoming president of one of the leading RPG development studios in Japan? Meet Toshihiro Kondo, president of Nihon Falcom, as he explains his journey in the gaming industry and path to professional success. Description: Meet some of the VAs in the Danganronpa series! Description: Are you a Ys fan? Then you won’t want to miss this awesome cosplay gathering, where some of the most awesome fans will gather, take photos, participate in trivia, and win prizes! Description: The second annual Red Moon Day gathering is about to begin! Join the Prinnies in fun trivia, awesome prizes, sweet giveaways and more! Who knows what else may happen at this gathering!? Description: Sohei Niikawa, President of Nippon Ichi Software, delves deep into the humble beginnings of NIS. Starting in 1998, he helped with the development of NIS games and worked his way to becoming President of NIS. Tune-in for Mr. Niikawa’s story and see what NIS has in store for the future, dood! Description: In the realm of action RPGs, the Ys franchise is unique in its own respects. The Ys franchise puts heavy emphasis on its gameplay mechanics. Nihon Falcom's President, Toshihiro Kondo, discusses the humble beginnings of the Ys franchise and how maintaining and evolving the Ys gameplay mechanics has made the franchise successful. Description: Over Twenty-five, dood. This is the amount of titles we will finish publishing by the end of 2017 alone. In this panel, NISA's marketing team discusses the evolution of NISA and the variety games NISA has published in the past. With key titles like Danganronpa V3: Killing Harmony, Ys VIII: Lacrimosa of DANA and Birthdays the Beginning, what other surprises does NIS America have in store? We’ll also have TONS of goodies to give away, so JOIN US, DOOD!